It has been said, "What can be conceived, can be created," but all too often we find ourselves reacting instead of acting and getting caught up in dreams without a vision to bring them into fruition. It is extremely easy to procrastinate too and to forget one's triumphs and talents by letting the imaginary negative record play on in our minds without even being conscious of it. I myself have fallen victim to this and I think everyone may at some point do the same. What helps to go beyond the negative realm of doubt, self isolation and passivity is to take small steps each day to work toward changing how one thinks and acts and recognizing the immediate positive feeling one gets when they feel they are doing something good for themselves because they have taken action. This positive reinforcement can best be remembered from a quote I recall Anthony Robbins saying, "The past does not equal the future." What you do in the present counts too. One of the best ways to move toward this direction is to keep a journal. Success Coaches, Martial Arts Instructors, and Psychotherapists are among the many who recommend this technique as a daily exercise. However you do not have to attend a seminar, take classes or seek out therapy to change the way you think and act by writing things down. All you really need paper and a pen. Now it should be noted that everyone does things in their own way. If something works for you then you should not put it down. However you can always learn new things and it helps to remind one's self by practicing the same way any artisan of any vocation or aspiring to one practices and through positive affirmation, hones their craft. This is where Thinking Anew: Harnessing The Power Of Belief comes in. Written by Eugene F. Moynihan and Richard F. Quis, two men of diverse backgrounds and expertise, the authors essentially get the reader started simply by buying the book, which in itself a 100 sheet, 200 page marble notebook, my preferred book for note taking and such. The authors go into their backgrounds and cite examples of how writing things down can harness your own way of changing the way one thinks and acts because the mere act of writing something down creates a physical step that can be visualized in a tactile way and there is truth to the fact that if you write things down you do begin to bring things to fruition. Not unlike taking notes in school. Here we are given examples and affirmations to follow to guide the reader toward using this process to reach their goals. Then after 34 pages of instruction and example, the authors leave the rest of the book to you, the reader, to in an essence become your own author and complete your own book of moving toward your goals by writing things down. It takes action, but the power of writing things down not only sets one on a path toward reaching their goals and improving their lives, it also can show one's thought habits and identify positive and spot the negative traits that you can then work on eliminating from your life. Now this is not a magic wand. No one can guarantee success anymore than a college can guarantee a job after a student graduates. It takes work and diligence and an ability to identify the course corrections you may need to make to reach your destination much like a plane pilot or navigator on a ship step by step plots the course to get to the heading as safely and quickly, according to the desired speed, as possible. 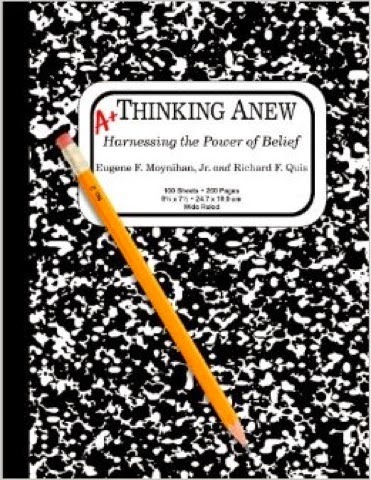 Thinking Anew: Harnessing The Power Of Belief by Eugene F. Moynihan and Richard F. Quis is an economical and practical method toward doing the things you want to do through simple and ever evolving steps and it gives the reader/seeker all the tools they need to get started just by purchasing the book. Thinking Anew: Harnessing The Power Of Belief is available now at booksellers on and offline on Trade Softcover at 206 pages and is published by QV Press. ISBN Number: 987--0-9849076-0-1 and lists for $14.95. For more information, please visit www.helpthinkinganew.com.